Tom was determined to get his folks down to Mt. Rainier National Park as part of their visit this Christmas, so even though the weather report was marginal at best, we loaded up the Suby with all of our winter gear, and headed south. 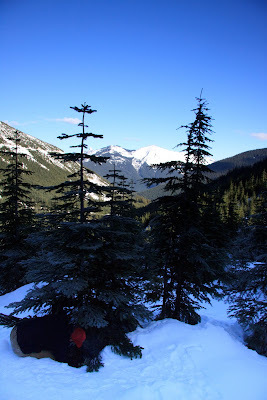 We arrived at Paradise, strapped on our snowshoes and headed toward the mountain. 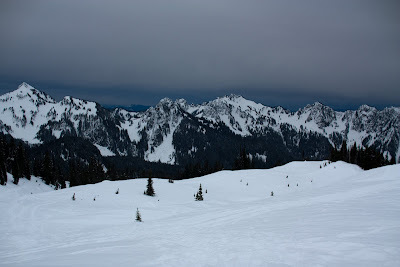 Rainier was mostly visible, which we would take as a win. 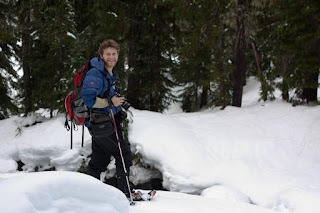 We snowshoed for about an hour, took some photos, got scared by the NASTY looking gray/black clouds moving in and retreated back to the parking lot. It was fun to get out and get some exercise, since I feel like all we’ve done since my winter break began was eat, drink, sit around and watch football, and eat again. Now, this is not a bad way to spend one’s vacation, but it’s not fabulous for the waistline. So exercise is good. Exercise with a view of Mt. Rainier and some wonderful family is even better. Paradise comes through again!! To continue in the vein of knitted baby products, I just finished the 10 cable hat from Hey Julie http://heyjulie.wordpress.com/2006/08/18/cabled-baby-hats/ for family friends who just gave birth to their first baby boy! 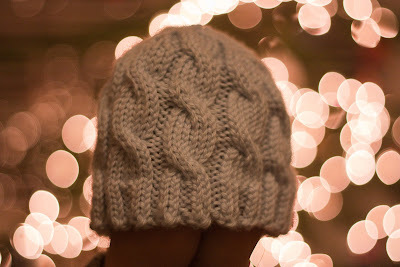 The cable pattern is easy to follow, and the hat is only 36 rows, so it’s also super fast. It’s a great pattern for stash busting, and I will be making several to have on hand for all the babies that are being born in our circle of friends this year. SUPER CUTE! Let me know what you think! Be Very Very Quiet…We’re Hunting Christmas Trees! 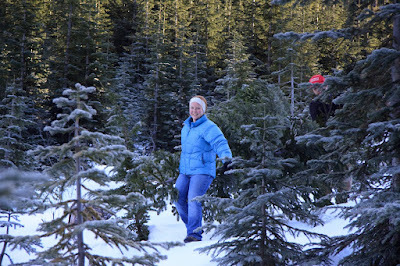 So about two weeks ago, we headed out to the mountains with Brendan, Ellie and Sierra to continue our tradition of cutting down our own Christmas tree. 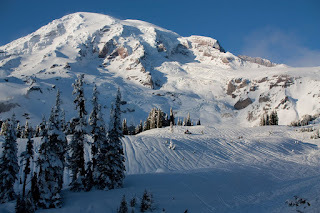 The Mount Baker-Snoqualmie National Forest runs a program every year that allows people to purchase a permit from the ranger station, and go out onto National Forest land and cut down your tree, which can be up to 12 feet tall. Last year, Tom and I went alone, and it took FOREVER to find our tree. This year, there was much more snow, it was MUCH colder, but we found our tree faster, so it was a win. Now, Tom gets more into this than I do, but it was still fun wandering around in the forest. Tom was all decked out in his “Alphin Logging” hat, his Demming Log Show suspenders and his Carhart pants, just to prove he was manly enough for this activity 🙂 After about an hour of looking, Brendan had found his tree and cut it down, and we had located ours. Tom dug out some snow around the tree and went to work with the tiny saw that Brendan had brought. After the requisite “timber”, (about 20 minutes later), we dragged our tree down and put it on the car. Now, a tree in the forest looks much smaller when it is compared to other trees in the forest. When we brought the tree home, we found it barely fits in our living room, being every inch of 12 feet tall. It’s wonderful! So yesterday, amid all sorts of travel and airline drama, I received my acceptance letter to Seattle University! I am a real grad student now! Yippie! Classes start next month, so wish me luck! Ok, so those of you out there who DON’T live in Seattle and don’t know who Tom Douglas is may be a bit confused about this. I will enlighten you. 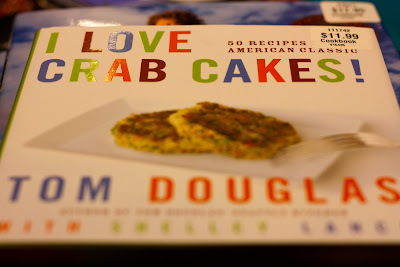 Tom Douglas is a local chef who owns several of the tastiest restaurants in Seattle. 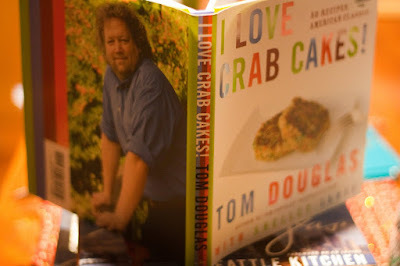 http://tomdouglas.com/ We love them. Especially Serious Pie which makes gourmet pizzas. NOM! Anyways, we met him while he was doing a book sale/signing at Costco yesterday! 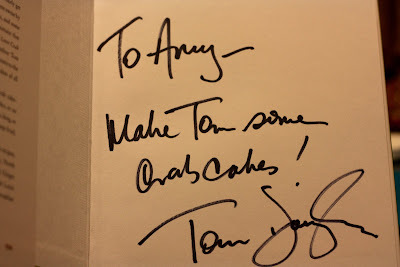 He was super nice and we talked to him for about five minutes about his different restaurants and the crab cake cookbook that I was buying for myself 🙂 We ended up buying several other cookbooks for presents. It is always cool to meet someone who is famous on a smaller scale, as they tend to be really interesting while still being approachable. Fun! 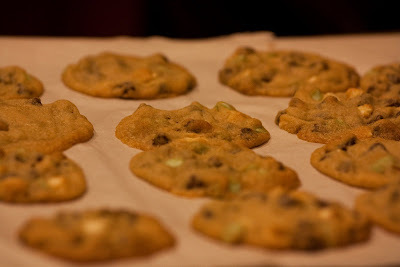 In honor of the Christmas season, I decided to try a new twist a gold standard cookie recipe in this house. The Williams Sonoma Essentials Of Baking has a great recipe for triple chocolate chip cookies which involve white, dark and milk chocolate chips. Well, while shopping the other day, I noticed MINT chips on the shelf! 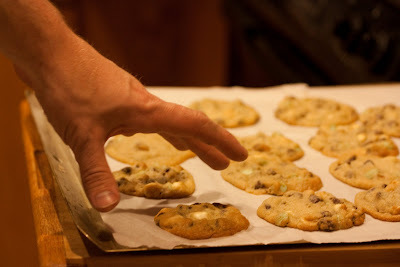 I love all things mint, and thought they would be a great addition to the cookie recipe. They smelled great in the oven, and were super yummy. I think they have slightly more oil than the standard chips, and therefore made the cookies thin out more on the pan, but they were still a WONDERFUL addition. The cookies turned out pretty well. As in they didn’t last 48 hours. YUM!! Two weekends ago, Tom and I were going stir crazy with all the gray weather and lack of exercise that this time of year tends to bring. 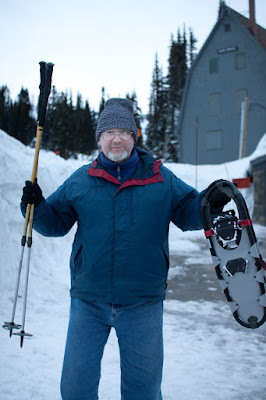 Bolstered by an optimistic weather report for the Paradise area of Mount Rainier National Park, we make the 2ish hour trek south for some snowshoeing. When we arrived , it was unfortunately VERY cloudy, as in no visibility, as in, what mountain? ::sigh:: So instead of heading up onto the glacier for the beautiful blue skies we anticipated, we did the Nisqualie Vista Loop trail, which is about two miles and is marked with nice, easy to follow poles. It was nice to get out and get moving, but unfortunately the waterproofing on my shell has worn off, and by the end of the two miles, I was soaked clear to the skin. Did I mention that we were hiking in a cloud? So we went back to the lodge to thaw out and have some lunch. After lunch, it was still dep ressingly cloudy, so we decided to do another short trail about two miles down the road, just to get some more exercise before we headed home. 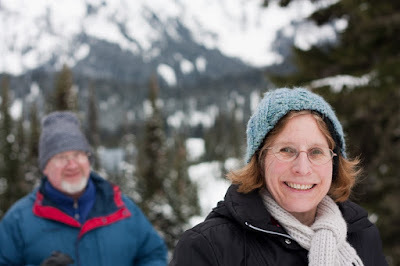 This was the Narada Falls trail that actually goes all the way to Paradise, which we want to hike in full sometime. That day though, we only hiked for another couple of miles, took some pictures and headed back after we saw the “waterfall”. Then we noticed something quite peculiar in the sky. There was BLUE! In the sky! 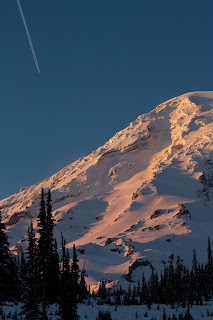 In the direction of Rainier!! We hopped back into the car and hurried back up to Paradise. 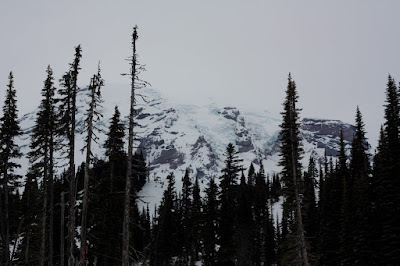 We rounded the bend, and BAM there was Rainier in all her glory. It quite literally took my breath away. I will never cease to be amazed by the gradure and beauty of the mountain. There are simply just not enough superlitives. We’re so blessed to live so close to such wonder. Paradise indeed. We will be back! Christmas Adventures Vol. 1 – Chistmas Ships! 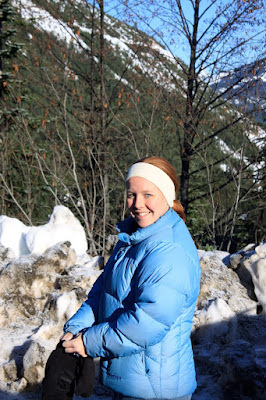 This is the first installment of our Christmas adventures thus far. Tonight, Tom and I went and had dinner with a coworker of mine and then we all walked down to the water to see the Christmas Ships! This apparently is a Seattle tradition that has been going on for decades, where the Argosy ships (dinner boat ferries mostly), get all decked out in their holiday best and sail to different waterfront parks around the area. Other boats are welcome to follow them around as long as they’re all lit up too. A choir usually sings carols which are broadcast over loudspeakers from the boat to the crowds gathered on shore. At our stop, we were treated to beautiful songs sung by the Seattle Boys Choir. We had never seen the infamous Christmas Ships before, and it was quite a treat! We’ll definitely be making this part of our holiday traditions in the future! So, continuing our attempt to learn more about food, and to try cooking and preserving local food through the winter, Tom and I attempted to make apple butter. We had all these grand designs of canning cute little 1/2 pint jars of apple butter that we would design precious labels for that we would give away for Christmas presents. Our friends and family would love them and think we were so amazing for coming up with such a unique gift idea. Yea. That didn’t happen. It turns out that apple butter is an enormous pain to make. It takes forever, it makes a HUGE mess, because the longer it boils, the more viscous it becomes, so when the boiling bubbles burst, it sends apple goo approximately the temperature of fresh lava flying across the kitchen. 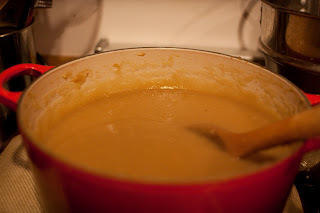 In the end, we decided to just freeze what we had made, which was somewhere between apple sauce and apple butter and not give this one away. 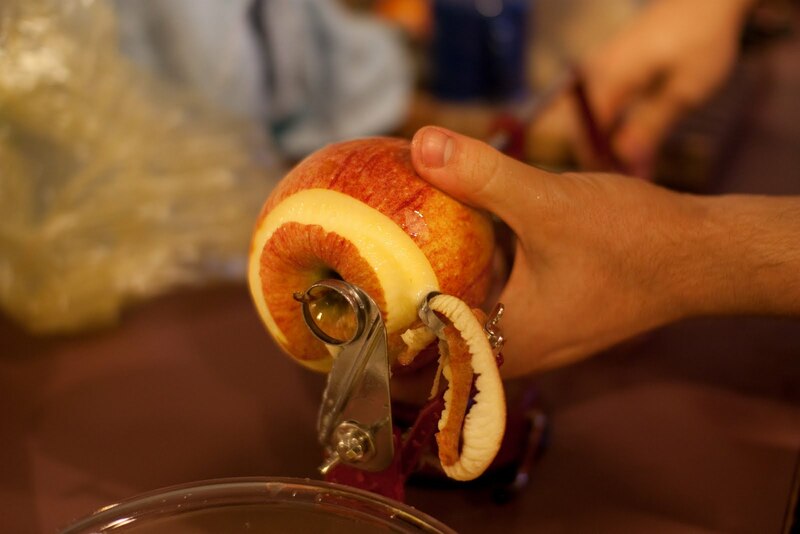 It still tastes delicious, so if you’re interested in yummy apple…um…product, let us know! But things have been a bit busy around here. Hopefully I’ll have some great entries next week about apple butter, Halloween, Fake Thanksgiving and the birth of Sierra Darby Fields! Stay tuned! !